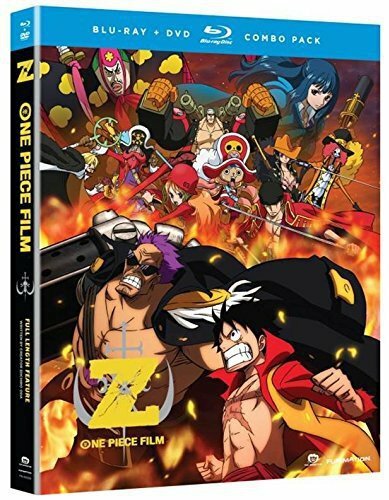 Film Z is the second One Piece movie to be personally overseen by series creator Eiichiro Oda! Said to be comparable to the Ancient Weapons of old, the Marines' trump card, the "Dyna Stones," have suddenly been stolen by a group of renegade vigilantes. The terrifyingly powerful man responsible, former Marine Admiral "Z," now stands in the path of Luffy and his Straw Hat Pirates. Can the Straw Hats defeat "Z" and his crew, or will the New World meet its end at the hands of this mad man? Special Features: Patrick Seitz at Sakura-Con 2014, In Theaters Commercial Collection, Japanese Promoo Video, U.S. Trailer, Trailers. Spoken Languages: English, Japanese, English subtitles.